The Manage Lists module is accessible through the Manage Lists button on the left of the Setup tab. 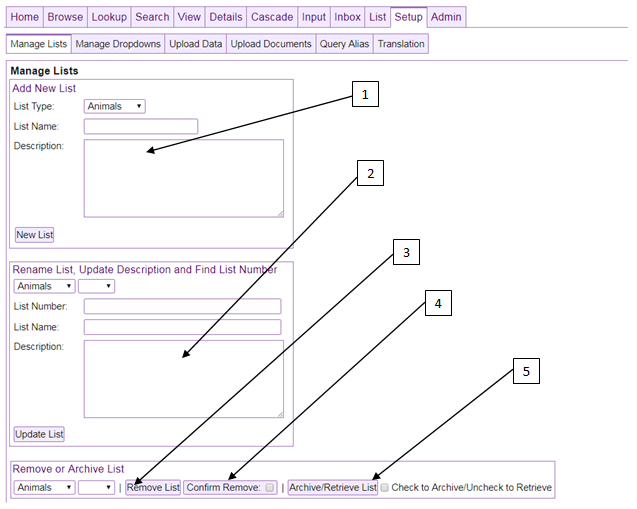 This module is used for creating, updating, removing and archiving lists. It is only available to users with Superuser or Admin permission. See the Lists (View) or Lists (Choose) module documentation for more information on Brimbox lists. The Create Lists area is for creating a new list. There is a dropdown for choosing which layout a list will belong to, along with areas for giving the list a name and description. Make sure to choose the desired layout before clicking the New List button. In this area you can rename a list and update its description. Choose layout type and list name from the dropdowns and the list will populate. Next alter the name of the list and the description before choosing Update List. These two dropdowns are for choosing the layout type and particular list to be removed, archived or unarchived. Once the layout and list are chosen, check the Confirm checkbox and click the Remove List button to remove a list. There is a list archive functionality to archive (or unarchive) lists chosen with the same dropdown used to choose lists for removal. This is generally recommended over list removal.